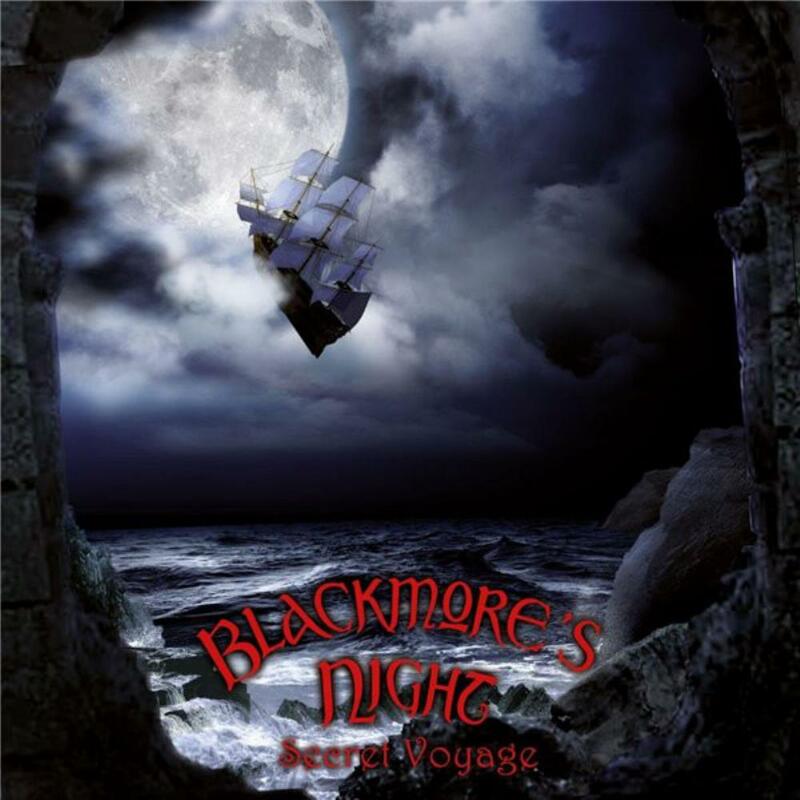 "Secret voyage" is Blackmore's Night's sixth studio album (excluding the seasonal release "Winter carols"). The moody sleeve illustration suggests an intention from the outset to create something both darker and perhaps harder this time around, an objective which is resoundingly fulfilled. Once again, many of the tracks are based on traditional songs, but the arrangements here are ambitious and adventurous. Take the opening "God save the keg" for example. This instrumental fanfare simply bursts with the pomp and grandeur, driven to greater an greater heights by organ and guitar. The first we hear of Candice Night's superb vocals is on "Locked within the crystal ball", a magnificent upbeat number running to over 8 minutes. Ritchie wastes no time plugging in for the track, his lead guitar sounding as vibrant as ever against a wall of sound his former bands would have been proud of. "Gilded cage" may be a ballad in the more traditional Blackmore's Night way, but even here the sound is decidedly full. The track features some superb violin credited simply to Gypsy Rose. "Toast to tomorrow", inspired by a traditional Russian song, has an unashamedly Romany flavour with lyrics about glowing fires, dancing through the night and drinking toasts. Ritchie's acoustic spot is a tribute to "Prince Waldeks Galliard", who reputedly lived in one of the duo's favourite castles. The distinctive tones of lead guitar return to introduce a revisiting of Rainbow's "Rainbow eyes" (from "Long Live Rock and roll"). I must confess, I was not particularly impressed by the song as it appeared on the Rainbow album, but the version here brings out aspects which have lain dormant for 30 years. The song, which is co-credited to Blackmore and Dio, naturally sounds rather different when sung by Candice Night instead of RJD, but the results are superb. Traditional wind instruments define the main character of "The circle", another darker, atmospheric song which demonstrates yet again the immense talent Candice Night has when it comes to writing an inspired lyric. The orchestration of the track is reminiscent of that on Rainbow's "Stargazer". "Sister gypsy" is a rather predictable Blackmore's Night standard. A decent enough song, but undistinguished. As the track concludes though, a thumping beat introduces one of the bands heaviest songs ever. The real surprise though is that it turns out to be a cover of "Can't help falling in love with you". Yes I mean the Elvis/Andy Williams favourite. This stonking romp through the song is as wonderful as it is radical, the blistering pace meaning its all over in just over two minutes. This is almost a punk interpretation, you'll either love it or you'll hate it. Normal service is resumed as Ritchie's intricate acoustic arrangement introduces "The peasant's promise". The familiar melody is based on an old English folk tune, Candice's lyrics telling a simple love story. "Far far away" is unusual in that it is an original composition written by Kenn Machin, a "friend" of the band. The song is well in keeping with traditional Blackmore's Night fare. The album closes with "Empty words" which, according to Candice, is "a sort of reprise of the introduction song". The song, which is a soft acoustic ballad with a pleasant traditional melody, forms the perfect conclusion to the album. For me, on "Secret voyage" Ritchie and Candice do exactly what they needed to do. While the album is totally recognisable as a Blackmore's Night album, it also breaks new ground and adds enchanting new dimensions to their repertoire. The fact that this combines with some excellent songs, and a stunning new band classic ("Locked within the crystal ball") means that we here have what may well become nominated as their best album to date. It is difficult to tell from the official album credits whether all the usual players are present. There is no drummer or bassist listed, and no mention of the delightful Sister of the Moon backing duo. Given the fullness of the sound though, one can only assume though that it is the credits which are incomplete. The limited edition digipak version includes the video for the title track of the previous album, "The village lanterne". The film includes footage of Candice as the Lady of the lake swimming underwater in a white dress (while singing!). This is interspersed with some altogether more violent medieval battle imagery.